Is it an apple? Is it a pear? It is in fact called an Asian Pear, or sometimes a Nashi Pear! It is a relative newcomer over here, but widely grown elsewhere in the world. Fruit at its best mid-season in October, pick from the tree to store. It is grown on a semi-dwarfing rootstock, so will reach 3-4M tall in 10 years or so. And now for something completely different! Is it an apple? Is it a pear? It is in fact called an Asian Pear, or sometimes a Nashi Pear, it is a very round russet apple-looking pear, with similar taste and characteristics to pears, sweet white flesh and it keeps really well too. It is a relative newcomer over here, but widely grown elsewhere in the world. The variety 'Kumoi' is self-fertile, so you will get some fruit from it, but you will get heavy crops pollinated by other pears - the commonly grown Conference and Concorde will do it well. Fruit at it's best mid-season in October, pick from the tree to store. It is grown on a semi-dwarfing rootstock, so will reach 3-4M tall in 10 years or so. 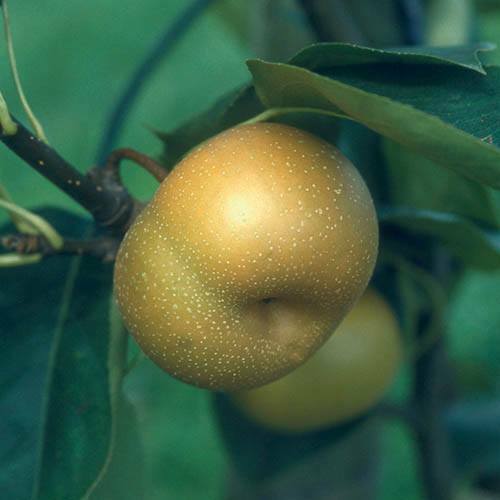 Asian Pear is a really unusual new addition to any fruit garden or orchard.